FERNANDINA BEACH, Fla. — The majestic wildlife, rugged landscapes and remarkable history of the African continent make it a dream destination for tourists around the world. It is also a land made up of diverse peoples and governments, many of them facing a variety of economic, environmental and social challenges each day. Fortunately, one group of tourists who turn their dreams of visiting the continent into reality, are also helping the economic situation for those who live there. 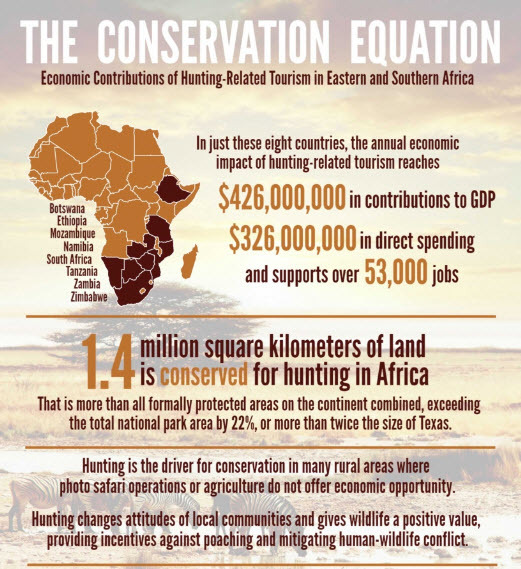 According to a recent study conducted by Southwick Associates on behalf of Safari Club International (SCI) Foundation, hunting tourism contributes as much as $426 million to the African economy each year. The study, “The Economic Contributions of Hunting-Related Tourism in Eastern and Southern Africa,” examined the extent of hunters’ annual spending and total economic contributions between 2012 and 2014 in eight top African hunting destinations: South Africa, Namibia, Zimbabwe, Botswana, Ethiopia, Mozambique, Tanzania and Zambia. More than 18,000 hunter tourists visit these countries every year, supporting more than 53,000 jobs. “Our results show that a substantial number of jobs and income are created by each hunter who visits Africa, and when you add them all together, hunting becomes a critical sector of the region’s economy,” says Rob Southwick, president of Southwick Associates, Inc. Southwick Associates is a leading market research and economics firm specializing in outdoor industries. “Considering that hunting occurs in regions where photographic safari operations and agriculture are often limited, the economic benefits of hunting are critical,” says Southwick. Photographic tourism and agriculture aren’t always viable or provide sufficient income on large expanses of the rural African landscape. In many rural areas, hunting is one of the few sustainable land uses that offers economic opportunity and incentives for conservation. Visiting hunters and their travel party on average spent 14 days in their destination countries with 11 of those days spent hunting. Travel parties most commonly consisted of three people, with two of these people actually hunting, while the third provides additional economic income to Africa. The United States provides the largest proportion of visiting hunters (74%), followed by Europe (16%). South Africa received the greatest number of visiting hunters (8,387) of those countries examined in the study. South Africa was followed by Namibia (7,076) and Zimbabwe (1,361). Average total spending per hunter is estimated at $26,000 with the average in-country expenses for the professional hunters’ package and fees, transportation, food, souvenirs and more is approximately $20,600.